Recombinant fragment corresponding to a region within C terminal amino acids 564-786 of Human STAT5a (UniProt P42229). 293T, A431, HeLa and HepG2 whole cell lysates; HeLa cells. Our Abpromise guarantee covers the use of ab155036 in the following tested applications. WB 1/500 - 1/3000. Predicted molecular weight: 90 kDa. Carries out a dual function: signal transduction and activation of transcription. Binds to the GAS element and activates PRL-induced transcription. 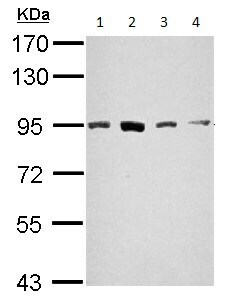 Tyrosine phosphorylated in response to IL-2, IL-3, IL-7, IL-15, GM-CSF, growth hormone, prolactin, erythropoietin and thrombopoietin. Tyrosine phosphorylation is required for DNA-binding activity and dimerization. Serine phosphorylation is also required for maximal transcriptional activity. 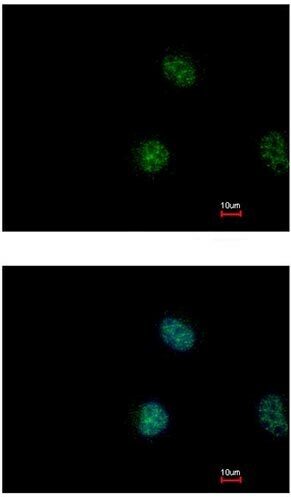 Immunofluorescent analysis of paraformaldehyde-fixed HeLa cells labeling STAT5a with ab155036 at 1/500 dilution. Lower panel co-stained with Hoechst 33342.
ab155036 has not yet been referenced specifically in any publications. Publishing research using ab155036? Please let us know so that we can cite the reference in this datasheet.